Can a weeknight-quick fettuccine dish really knock their socks off? 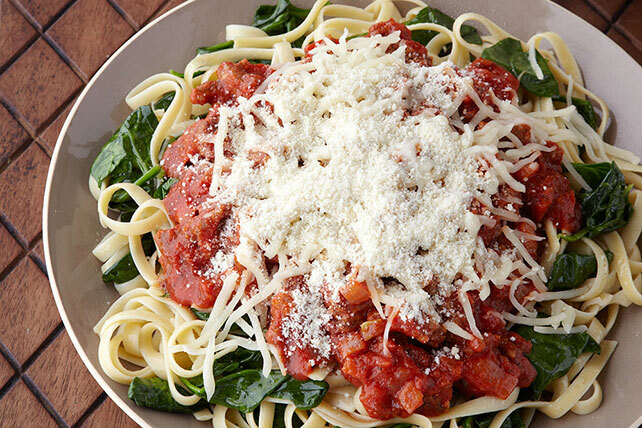 Get out the baby spinach leaves and Italian sausage—and see for yourself. Meanwhile, brown sausage with onions in large nonstick skillet on medium heat. Drain; return sausage mixture to skillet. Stir in pasta sauce; cook 10 min. or until heated through, stirring occasionally. Drain pasta mixture. Serve topped with sauce and cheeses.